Raised from the urban population of Sabaean society, this veteran cavalry corps has close ties to the Priesthood and fights raiders and marauding tribes almost as a way of life. 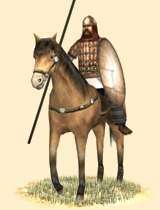 Historically, the Sabaean urban population was, besides Arab levies, the only other major component of their cavalry divisions. Hailing from a highly urbanized society, these men hailed from both small and large settlements, many helping to work royal land grants, a few riding horses provided by stables owned by their local High Priesthood, and some even enrolled in the forces of semi-independent city commanders. They were skilled veterans, their service during Sabaean campaigns leading them into the rugged mountains North of their well watered and fertile lands, fighting raiders and marauding tribes almost as a way of life. For this service, their pay was good and their lives away from campaign were fairly comfortable, but their strong association with the High Priesthood from engrained childhood perceptions to livelong economic and social relationships, leave their loyalty and dedication beyond reproach.